The Padholdr Fit series is our collection of stylish looking tablet holders that Fit all of your tablet holder needs in one design. The Fit series have several key features that make them very universal for whatever tablet holder application you might need. The Fit Small series is designed to fit tablets with either Small cases on them, or tablets that are Smaller than the standard tablet size. All Fit series are designed to allow ultimate access to plug ins and necessary buttons on your tablet along with locking and non locking hardware. The Padholdr Wall mounts are designed to allow you to mount your holder and tablet to the wall easy in just a few steps. 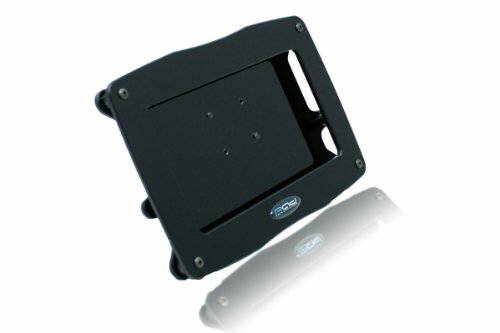 The wall mounts come in two options including a fixed mount design and a swivel mount allowing you to use the tablet in portrait or landscape modes. The wall mount screws to a flat surface, then the holder of your choice is bolted to the mount. If a swivel mount is opted for this installs between the wall mount bracket and the holder. Lockable Design Included with each Fit holder is a set of locking Allen bolts to assemble the holder. To allow the tablet to easily come out of the holder simply remove one of the tensioner spacers and now your tablet can come in and out freely. Anti Scratch Design The inside of the Fit series holder has a custom stamped out flocking material adhered to the Lexan that allows your tablet to easily slide in and out of the holder and prevent your tablet from getting scratched up over time. Our Fit series holders are manufactured to be able to adjust the width, height and depth of your holder to accommodate your tablet. Adjust the included spacers with your holder to create a nice fit around your tablet. Easy to Mount The wall mounts are designed to screw to any flat surface using two standard wood screws that are included. If mounting to concrete or other hard surfaces simply purchase anchor screws from your local hardware store. Docking Design If you are looking to charge your tablet while on the wall the wall mounts allow access for a power cord to be ran through the wall and out the mount. If you have any questions about this product by PADHOLDR, contact us by completing and submitting the form below. If you are looking for a specif part number, please include it with your message.